Jurassic World: Fallen Kingdom was a misfire of a sequel and even though I wasn’t a big fan of the first movie, there were some fun moments, this one at times just felt like a rehash of The Lost World: Jurassic Park but at the very least the ending could lead to an interesting finale. Universal Studios Home Entertainment provided me with a free copy of the Blu-ray I reviewed in this Blog Post. Hope springs eternal, I guess. 25 years following Jurassic Park, a not only technological achievement but an all around entertaining movie, there have now been four sequels, including Jurassic World which was a quasi-reboot. Although I wasn’t a big fan of Jurassic World, I did feel it was maybe passably average. Now comes the anticipated sequel, Jurassic World: Fallen Kingdom and somehow they managed to make an even dumber movie than its kinship of the series, The Lost World: Jurassic World, and boy you had some stupid characters in that movie. The film finds Claire Dearing (BRYCE DALLAS HOWARD) is called to the mansion of Benjamin Lockwood (JAMES CROMWELL), Hammond’s former partner, with a job offer to rescue several species of dinosaurs — as she has access to the tracking system to locate them — from the volcanic-active island, where they would be transported to a sanctuary, safe from human interference. But there is one particularly species that is tricky to get: the raptor. Claire just knows the man to call upon. 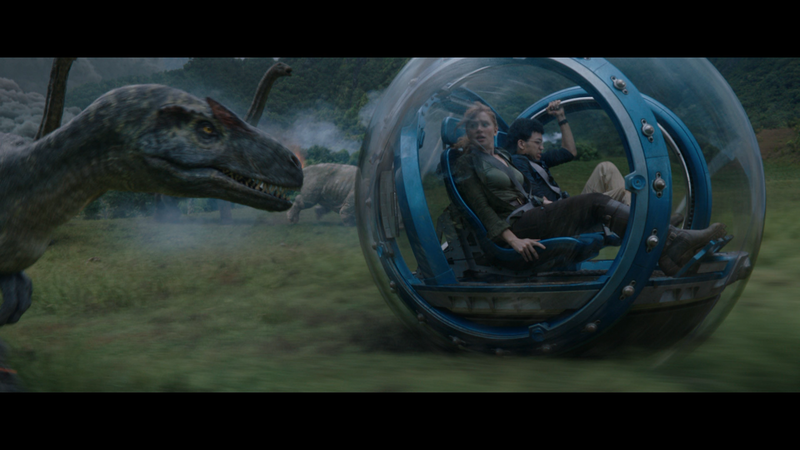 Although Owen (CHRIS PRATT) is initially hesitant to accept her offer, his love for Blue the Raptor overrides any concerns for the dangers of the mission. 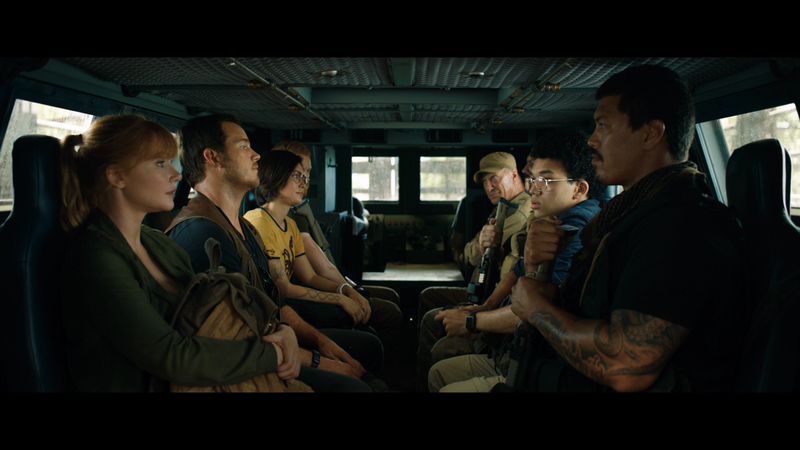 Along with systems analyst Franklin Webb (JUSTICE SMITH) and paleo-veterinarian Zia Rodriguez (DANIELLA PINEDA), Claire and Owen are transported to the island and shut down amusement park wrecked on by escaped dinos. Leading the military convoy is Wheatley (TED LEVINE). Soon enough, once Owen does locate Blue, Wheatley shows his true colors and becomes our bad guy… for at least this first half of the film. 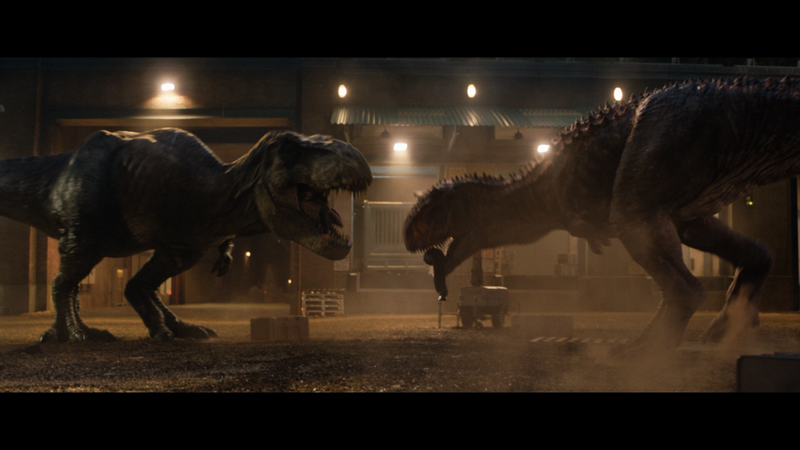 After Claire and Franklin narrowly escape a Carnotaurus, they make it aboard the last ship before the island explodes. Oh, and I’d remiss if I didn’t mention another character, Maisie Lockwood, Benjamin’s granddaughter, whose inclusion is quite pointless… until the end. I have to think that was her sole purpose to usher in the third and final movie of the Jurassic World trilogy. Jurassic World: Fallen Kingdom might’ve been a bad movie but I will say, it at least never made me angry, more so bored than anything. Now, it’s not all worthless, there is some talent that shows on screen with some nice visual effects and the mixture of the VFX with animatronics are impressive and I do respect the filmmakers went old school in some aspects. As for the rest, there wasn’t much I really enjoyed. The characters of Owen and Claire were never that well written in the first Jurassic World and it’s really more of the same, though thankfully they toned down the romantic parts for them. Pratt and Howard at least are likeable individuals so even when their characters were rather bland. The supporting roles are nothing special either. You had Daniella Pineda being spunky and Justice Smith portraying the scare-dy comedic relief. You do get a veteran actor James Cromwell but he only got a few scenes and Rafe Spall plays your typical greasy villain. Taking over directing duties from Colin Trevorrow, who is still on board as a co-writer and executive producer, and will be helming the third movie, Jurassic World: Fallen Kingdom was directed by J.A. Bayona who received critical acclaim for A Monster Calls and The Impossible. 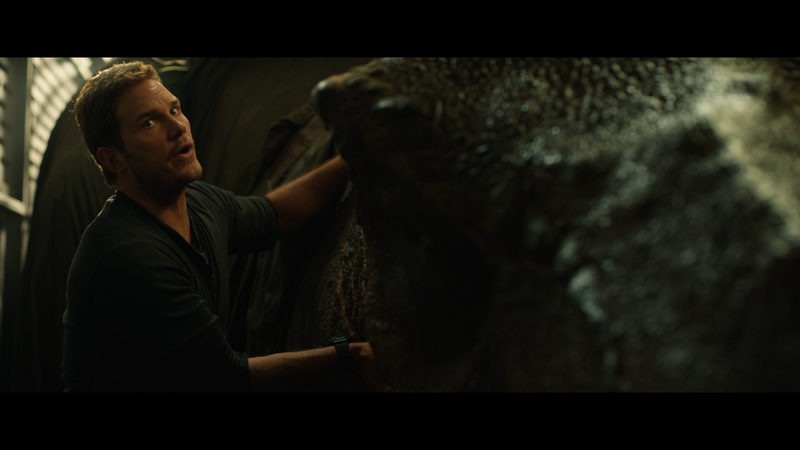 Here, Bayona does acquit himself well enough with good cinematography from Oscar Faura, who has worked with Bayona on all three of his previous films; just a shame the script wasn’t a little smarter, not to mention taking more than a few cues from The Lost World and having characters making really stupid decisions, so much even the normally charismatic Chris Pratt and Bryce Dallas Howard couldn’t make it work. 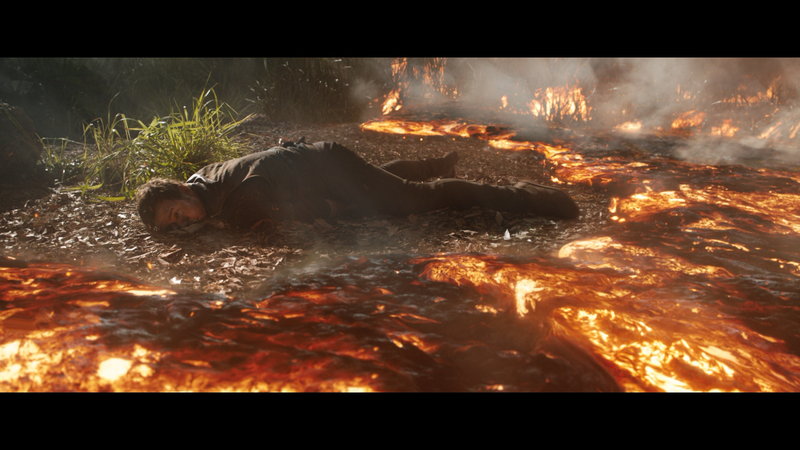 In the end, I can’t say Jurassic World: Fallen Kingdom was terrible because at least on a technical level there were impressive moments, but those were overtaken by a bad script, thinly written characters and just ridiculous, and not in a fun way, scenes. Admittedly, at least this does end in a way that could lead way to an interesting conclusion, but I’m not holding my breath. This release comes with a title-embossed slip cover and inside a Digital HD redemption code. All of the features are also on the 4K disc. There are a lot of featurettes and kind of wish these were combined together for one big making-of documentary… All told, combined these total 1:15:19. On Set with Chris and Bryce (3:05; 4K) is a short behind-the-scenes featurette about the chemistry between the two actors, plus footage of the pair sparring with one another and having fun on set. The Kingdom Evolves (4:33; 4K) is about the evolution, so to speak, of the franchise. Return to Hawaii (2:41; 4K) is a featurette on the production filming in the Aloha State where parts of the other Jurassic Park movies were also shot. Island Action (6:01; 4K) examines the filming of the major action sequences on the Volcanic exploding island. Aboard the Arcadia (5:53; 4K) looks at the scenes filmed on the boat which, of course, was a stage. Birth of the Indoraptor (4:09; 4K) is on the newest species of dinosaurs to be introduced in this franchise. Start the Bidding (3:18; 4K) – This featurette covers the fight/action scene towards the end of the film. Death by Dino (1:33; 4K) features some of the gruesome deaths, for the bad guys, in the movie. Monster in a Mansion (3:06; 4K) – This looks at filming the sequence inside the mansion as our heroes are being chased by the Indoraptor. Rooftop Showdown (3:48; 4K) focuses on the finale between the Indoraptor and Pratt & Co. from the storyboards, set building, to actual filming. Malcolm’s Return (3:07; 4K) chronicles the return of Jeff Goldblum for his short stint in the movie. VFX Evolved (7:08; 4K) – This shows the progression process of some of the scenes for the dinos. Pretty interesting, actually. Fallen Kingdom: The Conversation (10:16; 4K) – This is a nice little roundtable-esque discussion with Co-Writer/Executive Producer Colin Trevorrow, Director J.A. Bayona and Actors Chris Pratt, Bryce Dallas Howard and Jeff Goldblum. A Song for the Kingdom (1:26; 4K) is a song sung and played by Justice Smith on I assume either his final day or production wrap. Chris Pratt’s Jurassic Journals (12:09; 4K) is a series of interviews conducted on set by the actor. Jurassic Then and Now (3:06; HD) is a quasi-advertisement featurette from Barbasol on the franchise. 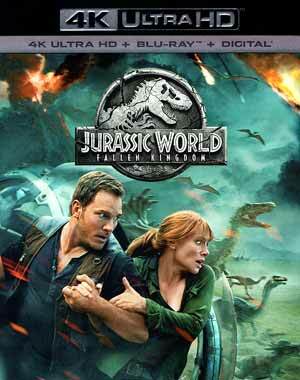 Universal unleashes Jurassic World: Fallen Kingdom presented in its original 2.39 widescreen aspect ratio and given a 2160p high-definition transfer (HEVC / H.265 codec). This does look terrific in 4K, colors are bright and brilliant courtesy of the HDR (and although my system doesn’t have it, Dolby Vision), detail is incredibly sharp throughout and something impressive, especially notable in the opening sequence, there is no banding with a smooth transition in the colors. Not to be outdone, the Blu-ray isn’t bad and although there is a decent difference in detail compared with the 4K disc, this was still a relatively impressive 1080p transfer and you can’t go wrong if you don’t feel the 4K UHD is worth the upgrade costs. Both the 4K UHD and Blu-ray discs comes equipped with a DTS:X track (DTS-HD MA 7.1 for systems unable to decode) and it is a sensation on your senses from your ears to your feet with the floor and walls rattling during the action sequences while also providing clear but resounding dialogue levels via the center channel. 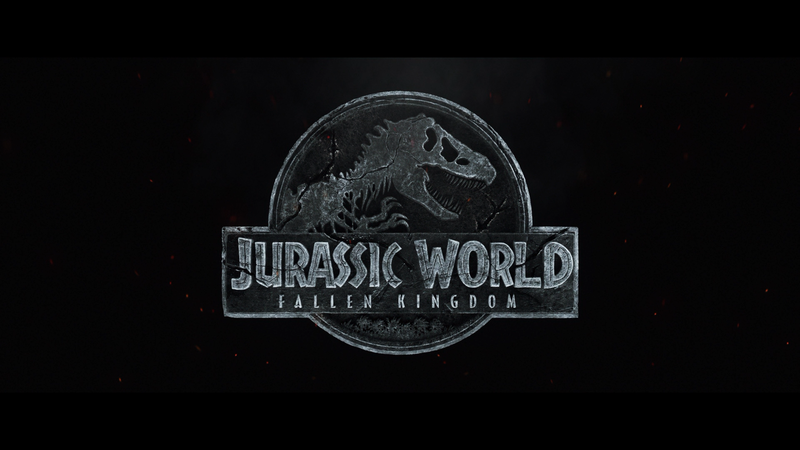 Overall, Jurassic World: Fallen Kingdom was a misfire of a sequel and even though I wasn’t a big fan of the first movie, there were some fun moments, this one at times just felt like a rehash of The Lost World: Jurassic Park with many of the same beats but at the very least the ending could lead to an interesting finale. The 4K and Blu-ray release offers up excellent video/audio transfers and a decent special features selection.